After traveling through the dry scrubland pampas of southern Patagonia, entering the snow capped mountain enclosure that surrounds Puerto Natales is soothing. Situated 150 miles northwest of Punta Arenas and 70 miles south of Parque National Torres del Paine, the town fronts Last Hope Sound, a long finger of water off the Straits of Magellan. 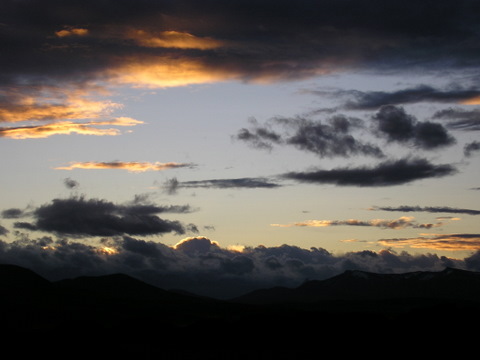 Across the Sound stretches the Paine Massif, a small range independent of the Andes. In back of the town are mesetas, long flat-topped cliffs of sheer rock wall that are in stark contrast to the verdant mountains and snowcapped peaks of Patagonia’s Andes. 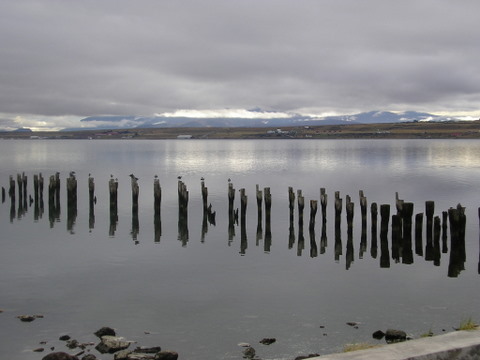 Until twenty years ago, Puerto Natales was a sleepy backwater fishing village with a few hundred residents. It still is a mixture of shabby (“rustic” depending on point of view) rusting tin roof houses, small ordinary shops, many small inns and B & B’s in converted homes and a dozen more luxury inns, with more being built. 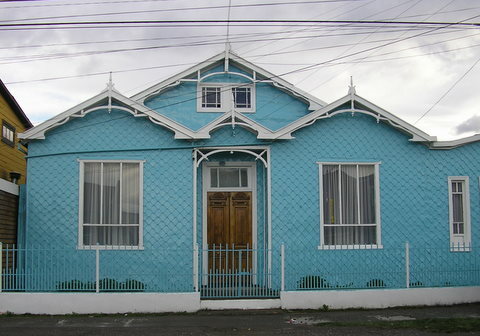 Yet the traditional architecture is charming - a hybrid of Victorian/Fuegian cottage. Some houses have intricate tin shingles. The town is expanding as an increasing number of middle class housing is developed. With a permanent population of 15,000, it swells in the summer season by many times that number. 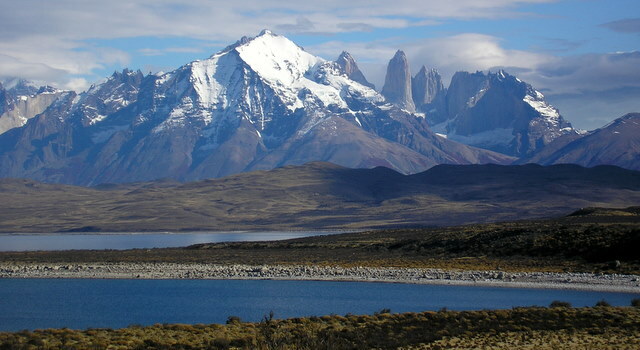 The reason for this transformation is the town's proximity to the incomparable Parque Nacional Torres del Paine , considered the jewel of Chile’s park system, a major destination for trekkers and mountain climbers worldwide. 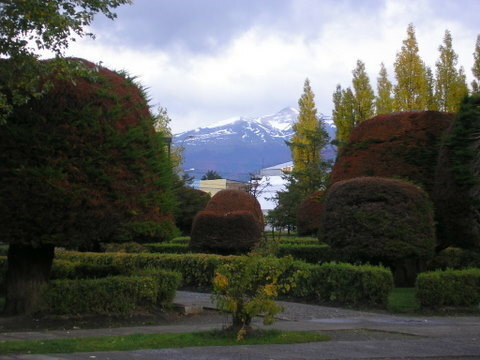 UNESCO designated the park an International Biosphere Reserve in 1978. 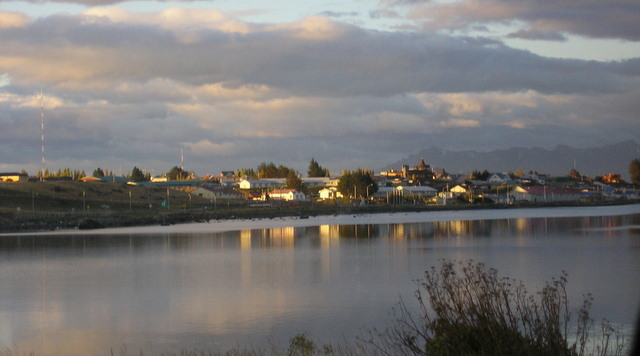 But off-season, especially during pleasant Autumn, Puerto Natales is laid-back and unassuming with just enough trekkers, speaking a dozen languages, to give the town an international charm. At the entrance on Costanera Pedro Montt is a giant welcoming statue of a nearly smiling Milodon - the prehistoric sloth whose skeleton was found in a nearby cave. 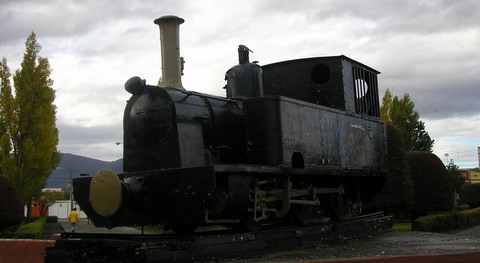 The main square, Plaza de Armas, lacks the military monument so common and opts for an original, slightly rusted, narrow gauge locomotive that was the common engine of transportation during southern Patagonia’s golden age of the wool industry. The town slopes down to the waterfront which has a wide, half-mile landscaped walkway with signage explaining the Paine Massif across the sound and the many wildfowl in the water - the black headed swan being the most prevalent. The tourist information office is located on the walkway. 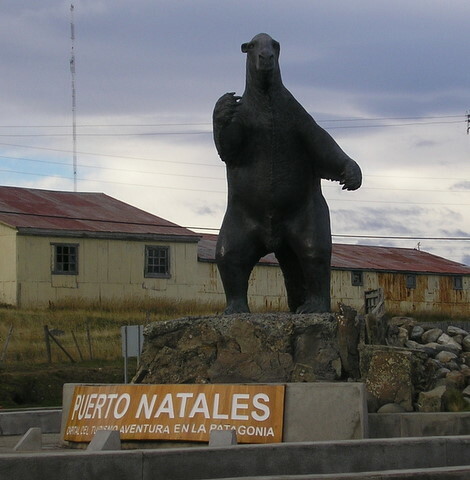 Puerto Natales is also the southern terminus of one of South America’s most scenic cruises. The Navimeg ferry sails for three days through the stunning fjords of Chile to Puerto Montt - a convenient entrance to explore central Chile or cross the Andes to Bariloche, Argentina. 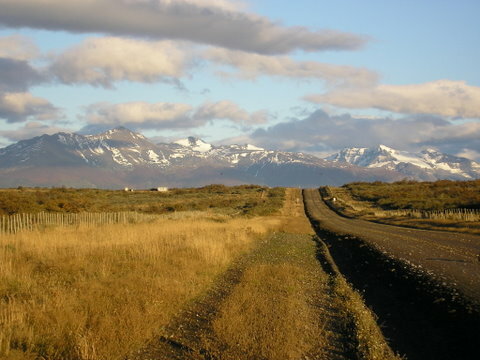 Although I’ve yet to make the journey, the many dozens of people I have spoken to say it is equal, if not superior, to more costly cruises to Alaska and Scandinavia’s fjords. Accommodations vary widely from B & B’s in private homes, some of which look questionable, to small inns, hostels and several luxury hotels on the waterfront. Advanced reservations in summer season are essential, but in Autumn, the pick is yours at a discount - although a few close after summer. I choose Hostel Lili on Auturo Prat 469 just a few blocks from Plaza de Armes. It was a pleasant, modern two-storey house with both private rooms/bath as well as four-bunk/shared bath dorm rooms. Ivan, the owner, is a friendly young man who is an expert on trekking and conducts guided hikes through the park. 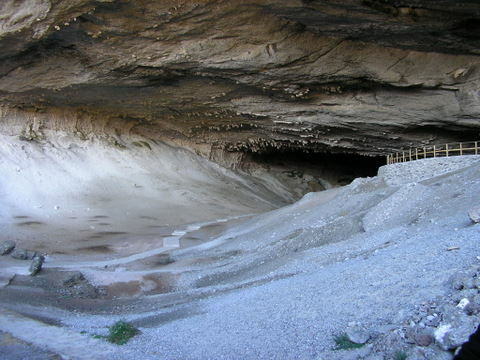 He will also arrange tour excursions of the Park and other surrounding sites. There is free WI-FI internet access, kitchen facilities and a nice continental breakfast, with yogurt and juice, from 6:30 - 11:00 am - although with Chile’s standard instant coffee. My private room with a nice size modern bath and comfortable bed was CH$14,000 (US$24.50) per night. 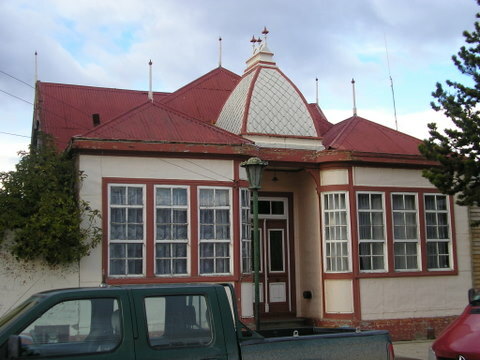 Most visitors just spend a night in Puerto Natales, either on their way to a multi-day trek in Torres del Paine or to board the Navimeg, but the town is worth at least two nights just to absorb the small village atmosphere and sample some surprisingly good restaurants. 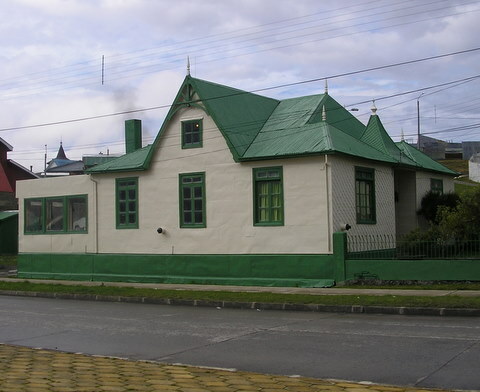 I can recommend three good Puerto Natales restaurants.